This question is very similar to Is it possible to always show hidden/dotfiles in Open/Save dialogs?. How to show hidden files and folders in finder? is also related. However, I don't want to always show them, and that's what defaults write ... AppleShowAllFiles ... does. Linux and Gnome allow us to CTRL+H to toggle between showing and hiding hidden files. But Gnome hotkeys don't work on OS X (which is expected). A related question... As can be seen above, typing the filename in Finder (or is it Spotlight) search did not work. I tried to right click to get a context menu in the File Open dialog in hopes of checking a box like "show all files". And I tried the View menu looking for a "show all files" with the File Open dialog open. Why is this hidden away somewhere? What purpose does it serve to not allow a user to easily open a file? ⌘ CMD+⇧ SHIFT+. 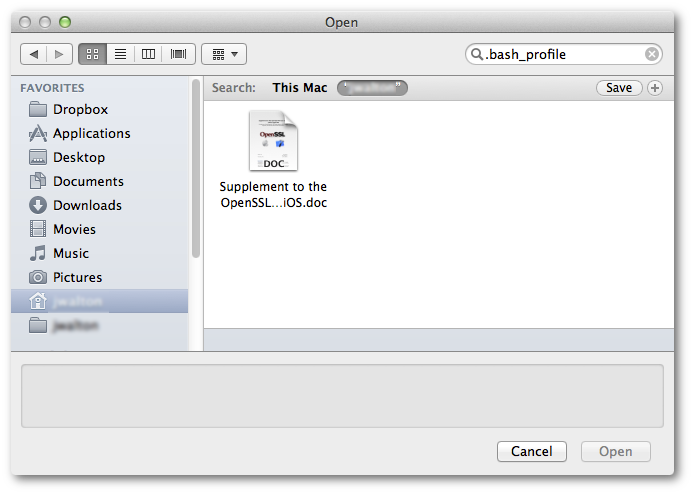 reveals hidden files in Finder and Open/Save dialogs. You can also press ⌘ CMD+⇧ SHIFT+G and type the path to the hidden folder, just like in Terminal (⇥ TAB autocompletion also works). Editing hidden files can be dangerous if you don't know what you're doing. Mateusz Szlosek covered the first part. Below is how I have handled the second part for my own use. In my haste to post my answer, I did not realize the second part has already has been answered. See How to set ⌘ + H to enable show hidden files. What I offer below differs by a dialog informing you of the current status. This will cause either pop shown below to appear. The steps to create the service are give below. Open the Automator, select a new document of type Service. Drag the action "Run Shell Script" to the workflow pane. The text for the script is repeated below. Save (or move) the Toggle Hidden Files.workflow file to the ~/Library/Services folder. You may need to relaunch the Finder application in order for the service to appear on a menu. Building off of Mateusz Szlosek's answer, I see the keyboard shortcut ⌘ CMD+⇧ SHIFT+. could be added for my service. Go to System Preferences and click on the Keyboard icon. Select "Services" then "Toggle Hidden Files" under the "General" heading. Replace "none" with the ⌘ CMD+⇧ SHIFT+. keyboard short cut. Hidden files are hidden for a reason usually. Use the script below only if you're reasonably sure you know what you're doing. In other words: If you break your system by randomly deleting hidden files, it's your own fault. Here's the script I use to toggle show/don't show hidden files inside Finder. Most scripts don't do anything else after killing Finder. Usually, this means you have to navigate back to the folder you were in originally, since the automatic Finder relaunch doesn't reliably open your last active folder. The script below instead reopens, and focuses on, your last active folder, i.e. the folder you were in when using the toggle, but now showing (or not showing) hidden files. I assigned a shortcut to it (cmd+shift+.) and find working with hidden files in Finder a lot more convenient now. Credit to Tetsujin who posted a script on this site a while ago that I adapted to add the 'reopen last folder' functionality. set oldHiddenVisiblesState to do shell script "defaults read com.apple.finder AppleShowAllFiles"
---- Sleep hack mentioned below. 0.5s minimum, 1-2s safer. Ugly, but (probably) unavoidable. do shell script "killall Finder; sleep 0.5s"
To use the script: Open a new workflow in Automator, drag in "Run AppleScript", copy&paste the code above, and save inside your services folder (usually, ~/Library/Services/, afaik). Attaching a shortcut to execute a script should be covered somewhere else on this site. I limited the scope of my shortcut to Finder alone. I have to resort to a bit of an ugly hack, using 'sleep' after killing Finder, before manually opening the original folder. If I don't force this delay, there's a chance OSX relaunched Finder already and opened a folder (not necessarily the last active one, in my experience). Together with my own 'open' command, this can lead to the nasty effect of two (unkillable, even) Finder processes running, and Finder not working anymore at all. If this happens, logging out and back in again fixes it, but it's a waste of time obviously, so I use 'sleep'. A sleep value of 0.5s works for me, but to be on the safe side, you can slightly increase it (adding a more noticeable delay to the process then). If someone knows of a way to either suppress the Finder relaunch and unreliable opening of some window after sending the killall signal -- or some other way to get rid of the 'sleep' hack -- I'd be happy to hear it! Not the answer you're looking for? Browse other questions tagged macos hidden-file . Is it possible to always show hidden/dotfiles in Open/Save dialogs? Display hidden files hot key on Mavericks gone?